A syndrome, usually diagnosed in childhood, characterized by a persistent pattern of impulsiveness, a short attention span, and often hyperactivity, and interfering especially with academic, occupational, and social performance. Don’t get me wrong when you read this, but I really find some of the worst sites on The FWA: Favourite Website Awards. Sure they are pretty and sure they find some interesting ways to visually communicate a product, but they are rarely consumer focused. 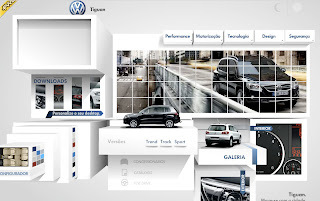 Take for instance the latest FWA winner the Volkswagen Tiguan Portugal site. Like a lot of Favourite Website Awards it is visually interesting. It’s also visually annoying. This cute little sport utility vehicle must be a highly configurable car with lots of options, seat configurations and sport versatility. Why do I think this? Because the site is dynamically reconfiguring itself constantly while I am trying to navigate through it. It’s as if I’m in the car, sitting there minding my own business when magically the glove box pops open, the rear seat folds down and the passenger door opens and shuts by itself. Sound confusing? It is. The Tiguan site does a similar bizarre dance while you are trying to click on the image gallery, learn about the performance options and…wait, just wait a second, the gallery just disappeared and moved to another position on the screen! Now like I said above, don’t get me wrong the site is pretty and visually cool, but this is about promoting a new vehicle not testing the attention span of your potential customers. Moving navigation that keeps rebuilding itself is annoying, to say the least, but it must be really frustrating if you are someone interested in the product and have to keep fighting with the site to get at what you want to see. Maybe the Portuguese are people who have a love for visually erratic art and have a lot of patience? All I know is in my experience of usability testing and working with some great interface designers that this site would be a consumer nightmare. Beautiful yes. Usable only if you have a lot of time. On the web, I find a lot of automotive consumers are not that patient when Flash animations take over to a dizzying degree.